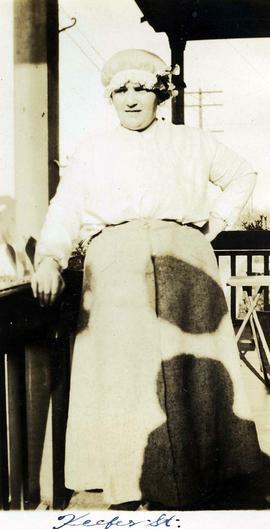 B&W print depicts Mrs. Ann Snider standing on the porch of their house posing for the camera. "Keefer St." is written along the bottom of the image.Note: colour adjusted on jpg. 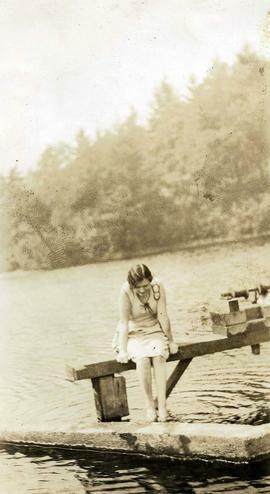 B&W print depicts an unknown woman sitting on a dock with water below.Note: colour adjusted on jpg. B&W print depicts Jeanette and Mrs. Ann Snider posing for the camera. Jeanette is holding a doll. "Mahon Park" is written on the bottom of the image. B&W print depicts an unknown woman sitting on a bench. "Harrison B.C." is written on the bottom of the image.Note: colour adjusted on jpg. B&W print depicts Mrs. Ann Snider posing for the camera with what appears to be scissors in her hand. "Mother" is written on the bottom left of the print.Note: colour adjusted on jpg. B&W print depicts two unknown young women posing together and the image is taken from the waist up. The words "Nell. &" (sp?) are written at the bottom centre of the image.Note: colour adjusted on jpg. B&W print depicts an unknown woman named Margie sitting in a doorway. "Margie" is written along the bottom of the image.Note: colour adjusted on jpg. Photograph depicts Sonia Nemetz Victor posing in a costume.